A fun, informative full-color illustrated introduction to the lives and art of major artists developed especially for young students. 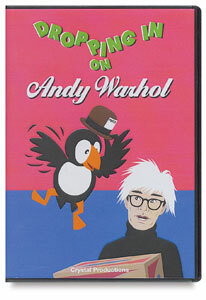 Each DVD and companion book features Puffer the bird as interviewer and includes reproductions of key master works. Puffer analyzes the paintings, and children learn new ways to observe and think about art. Recommended for elementary through middle school students. Each DVD is 20–27 minutes long, and includes a teacher's guide with suggested activities. Delightful 32-page companion books are also available, and they reinforce all of the material presented in the DVDs. Dropping in on Renaissance Artists — Join Puffer as he drops in on Florence, Italy, the birthplace of the Renaissance, and learns about the art of Michelangelo, Leonardo da Vinci, and Raphael. 20 minutes. Dropping In on Grandma Moses — Join Puffer the puffin as he drops in on famous folk artist Anna Mary Robertson Moses, better known as "Grandma Moses" because she didn’t start painting until she was 70 years old! Dropping in on Impressionists — Join Puffer the puffin in a delightful jaunt into 19th century France, the birthplace of Impressionism. Learn how Claude Monet, Mary Cassatt, Edgar Degas, Edouard Manet, Pierre-Auguste Renoir, and Camille Pissarro came to create an entirely new kind of art. The 18-minute video contains animated biographical sequences combined with details and full-screen images of masterworks including "The Dance Class," "The Races at Longchamp," "Luncheon of the Boating Party," "The Japanese Footbridge," and more. Dropping in on Andy Warhol — Pop artist Andy Warhol shows Puffer famous artworks and explains how he used different media to create them. 20 minutes. Dropping in on Grant Wood — Puffer and Wood discuss the artist's life and regionalist artwork which includes the famous American Gothic , The Midnight Ride of Paul Revere , and Fall Plowing . The 20-minute video highlights Wood's interest in the countryside and his heroes. Dropping in on Matisse — Puffer flies into 20th century Paris to meet Henri Matisse and discovers how Matisse's paintings evolved from colorfully painted patterns to unique paper cutouts. 24 minutes. Dropping in on Romare Bearden — Puffer lands in New York City to interview the famous artist Romare Bearden. Bearden uses a variety of media to make his unique images depicting family, urban life, and music themes. Puffer analyzes the artworks and thereby helps children to learn new ways to observe and think about art. 19 minutes. Dropping in on Rousseau — Puffer learns how self-trained artist Henri Rousseau developed a unique style of painting birds, animals, and plants. 27 minutes.